France is reknowned throughout Europe and the world for its cuisine, and rightly so - French cuisine is generally considered one of the most refined and elegant in the world. In French cuisine, some dishes which are considered national dishes, eaten throughout France, and others with specific regional origins. One common factor in all French dishes is an emphasis on good quality ingredients (especially local produce), and careful preparation. Andouillette - A traditional French sausage, from Lyon, Troyes or Cambrai. Andouillette may be eaten hot or cold, and has a very strong odor that some people consider very unpleasant, and is very much an acquired taste. Please note: The prepared version of andouillette sold in the United States is not the same! Beef Bourguignon (French: Bœuf bourguignon) - Beef stew cooked in red wine, flavored with garlic and herbs, carrots, onions and lardons (bacon from the back fat of a pig), and then garnished with onions and mushrooms. Blanquette de veau - Veal, mushrooms and onions cooked in a thick cream sauce. Bouillabaisse - A fish stew, originally from Marseille. Usually a variety of different fish and shellfish are used to prepare the soup, as well as celery, leeks, onions and tomatoes. The stew and the fish are usually served in separate bowls, with the vegetables poured over French bread seasoned with bread crumbs, olive oil and chili peppers ("rouille"). Coq au vin - Chicken fricasseed with wine, lardons, mushrooms, and garlic. Traditionally, older roosters are used in the dish, as they contain more connective tissue resulting in a richer broth. Crêpes - Thin pancakes made from wheat flour. Originally from Brittany (French: Bretagne), they come in both savory (crêpes salées) and sweet (crêpes sucrées) varieties. 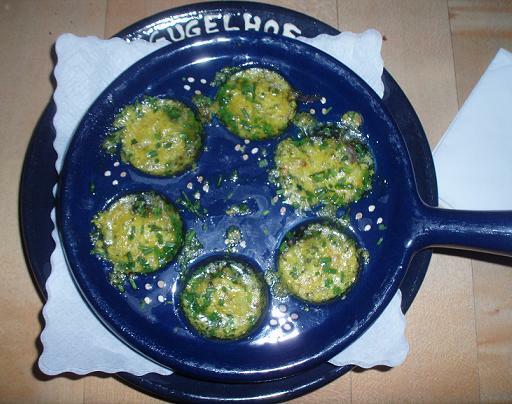 Escargot - Land snails cooked with parsley butter. This dish is often served as an appetizer. 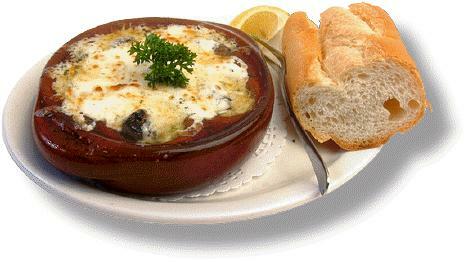 French onion soup - A soup made from onions and beef broth, topped with cheese and croutons. According to legend the soup was invented by King Louis XV of France. Le Tourin - A traditional soup from the Dordogne region. It has a strong garlic flavor, and is best served over thinly sliced bread. Lobster Thermidor - A creamy mixture of lobster meat with egg yolks, brandy or sherry, a little powdered mustard, and an oven-browned cheese crust, stuffed into a lobster shell. Pot-au-feu - A spiced beef and vegetable stew. Typically carrots, celery, leeks, onions and turnips are used in the dish. 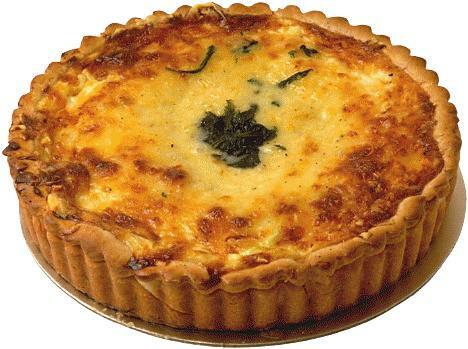 Quiche Lorraine - This is a baked dish made with heavy cream, eggs and bacon in a pastry crust. The traditional recipe does not contain cheese. A variant of the recipe, which differs by the addition of onion, is known as "quiche Alsacienne". Crème brûlée - A custard base, usually flavored with just vanilla, and topped with a hard layer of caramel made by burning sugar under a grill or other intense heat source. Éclair - A hollow baked pastry, allowed to cool, and then filled with pastry cream (crème pâtissière), custard or whipped cream, and then topped with chocolate or icing. Profiteroles - Small baked pastries filled with pastry cream (crème pâtissière) or whipped cream. Often served with chocolate sauce. Readers everywhere fell in love with Mimi Thorisson, her family, and their band of smooth fox terriers through her blog, Manger, and debut cookbook, A Kitchen in France. In French Country Cooking, the family moves to an abandoned old château in Médoc. While shopping for local ingredients, cooking, and renovating the house, Mimi meets the farmers and artisans who populate the village and learns about the former owner of the house, an accomplished local cook. Here are recipes inspired by this eccentric cast of characters, including White Asparagus Soufflé, Wine Harvest Pot au Feu, Endives with Ham, and Salted Butter Chocolate Cake. Featuring evocative photographs taken by Mimi’s husband, Oddur Thorisson, and illustrated endpapers, this cookbook is a charming jaunt to an untouched corner of France that has thus far eluded the spotlight. With beguiling recipes and sumptuous photography, A Kitchen in France transports you to the French countryside and marks the debut of a captivating new voice in cooking. "This is real food: delicious, honest recipes that celebrate the beauty of picking what is ripe and in season, and capture the essence of life in rural France." Soufflés, boeuf bourguignon, macarons, and more―the French make it look so easy―and now it is for you too. The Voilà! 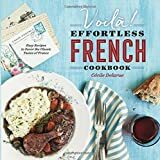 Effortless French Cookbook serves up simple recipes to bring classic French fare and flare to your table for everyday delicacies. From the cafes in Paris straight to your kitchen, this French cookbook combines tried-and-true recipes with the convenience of easy-to-find ingredients and fast prep and cook times. Complete with guidance to help you get savvy about sauces or poach the perfect egg, Voilà! Effortless French Cookbook lets you say au revoir to the hassle of complicated recipes. French Cuisine 101―Learn basic skills, techniques, and fun facts about French culinary culture. 125+ Classic Recipes―Feast on a full range of recipes from aperitifs, main dishes, desserts, and more. Easy-to-find Ingredients―Find affordable ingredients at your local grocery store and forget about expensive imports once and for all. Get ready to say bon appétit with Voilà! Effortless French Cookbook. No passport needed.